Batman: Arkham City is filled with various Batmans (Batmen?). So it makes sense for the game's limited edition bundle to have variety, too. Can You Possibly Have too Many Batmans? Batmen? 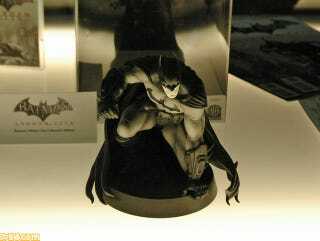 Europe and the U.S. are getting a black-and-white Batman statue, sculpted by Kotobukiya. Japan is getting a color Batman. They both look fantastic, and picking one over the other is no easy task. Batman: Arkham City is the upcoming sequel to Batman: Arkham Asylum and will be out this October in the West and this November in Japan.